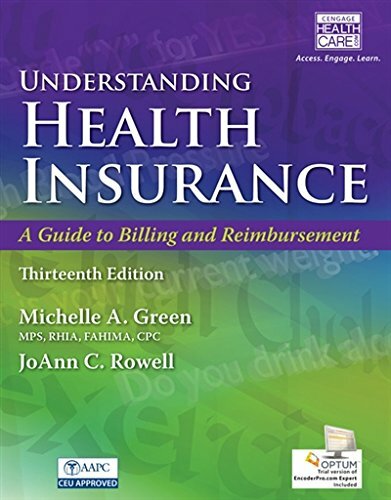 1305647424 -Discover the essential tool to prepare for a career in medical insurance billing — UNDERSTANDING HEALTH INSURANCE, 13E. This comprehensive, easy-to-understand, updated book presents the latest code sets and guidelines. You cover today’s most important topics, such as managed care, legal and regulatory issues, coding systems, reimbursement methods, medical necessity, and common health insurance plans. Updates introduce new legislation that impacts health care, including the Affordable Care Act (Obamacare); ICD-10-CM coding; electronic health records; Medicaid Integrity Contractors; case mix management; hospital-acquired conditions; present on admission; and value-based purchasing. Practice exercises and the workbook (available separately) provides application-based assignments and case studies to reinforce your understanding, as well as CMRS, CPC-P, and CPB Mock Exams. New editions include online access to SimClaim™ CMS-1500 claims completion software and Optum’s EncoderPro.com Expert™.